The most exclusive cabin in the Singapore Airlines fleet features only four seats. Here's our experience of spending 18 hours in two of them. * Note that we booked this redemption before the January 2019 KrisFlyer devaluation, and therefore secured it at the previous miles rate. The current redemption rate would be 130,000 KrisFlyer miles + US$25.99. Singapore Airlines has a strict check in opening time at San Francisco of 3 hours 30 minutes prior to departure for all cabin classes. No early check in is possible. We arrived at the airport slightly before this as we were keen to maximise our time in the brand new United Polaris lounge. Also due to the late departure of this flight we had already been killing some time in the city having had to check out of our hotel room in the afternoon. This may have been the case for other passengers too as quite a sizeable queue had formed in advance of check in opening time. Thankfully there was no queue at the First Class desk and as soon as check in opened we were promptly invited to come forward, with all formalities completed in a matter of minutes. We were checked in shortly after 9.45pm and there was no queue at security, so despite there being no priority lane for First Class passengers we were through and into the lounge by 10pm. If you’re planning to skip the lounge and minimise your time at the airport, note that Singapore Airlines check in at San Francisco closes 40 minutes prior to departure time. If you’re flying in Business Class or First Class with Singapore Airlines from San Francisco you’ll be invited to use the United Polaris lounge there. It’s an invitation you’ll definitely want to take up. Facilities at this excellent lounge include an à la carte dining room, a manned cocktail bar, showers and quiet rooms for a nap. For this particular departure time we found the lounge to be very quiet, with no wait for the showers (ideal if you had to check out of your hotel several hours earlier, as we did). Do be aware that à la carte dining finishes at 10.30pm so you may want to head straight to the dining room on the second floor if you want to experience that, assuming you’re flying on this SQ1 departure. More details are included in our full review of the lounge. If you are a KrisFlyer Gold or Star Alliance Gold status holder flying in Economy or Premium Economy Class, unfortunately you will not be eligible to use the Polaris lounge and will instead have access to the United Club. We left the lounge at 12.40am, around 30 minutes prior to departure time, by which time it had become practically deserted (it closes for the night only 20 minutes later). With a 10 minute walk to the gate boarding was already well underway when we arrived at the aircraft, however there was a dedicated First Class boarding lane and airbridge to the forward left door only for the four First Class passengers, so we were soon onboard and shown to our seats by the crew. Although when we first booked this flight we were the only two passengers seated in the First Class cabin, we opted for a window seat (1F) and a middle seat (1D) rather than the usual middle pair which is more suited for couples, simply so that we could write a thorough review of both seat types. By the time it came to the flight itself the other two seats in this small cabin had also been booked, providing a good opportunity to check whether the middle pair had sufficient privacy for solo travellers as I would be travelling next to a stranger in 1C. The passenger in 1C however was only flying as far as Hong Kong, with no one else joining the First Class cabin there, and so with only three of us flying on the Hong Kong – Singapore sector we secured the 1C / 1D middle pair on that shorter flight. First impressions of the Singapore Airlines 2013 First Class cabin are a warm, elegant colour scheme. Though the cabin is a single row, it doesn’t feel small with a high ceiling due to no overhead lockers, and soft mood lighting. The cabin was styled by BMW Designworks, and still looks fresh and modern despite being over five years old. Originally this cabin featured eight seats across two rows, however with the introduction of Premium Economy it was gradually reconfigured and all 777-300ER aircraft in the Singapore Airlines fleet now have this four-seat version. One of the first things you notice when you see this cabin for more than a few seconds is that the layout is not quite as simple as that depicted on the Singapore Airlines seat map. In fact the window seats (1A and 1F) are set back at least six inches from the middle pair (1C and 1D). Another unusual feature is that with only one row of seats in this cabin on these aircraft the airline has (either deliberately or by necessity) included some significant space behind the middle seats ahead of the bulkhead separating First Class from the Business Class section. This did not previously feature when the two-row First Class cabin was installed on these aircraft, either in the 2006 or 2013 versions. This area has a bar-height shelf on the back wall, and so could be used to stand with a drink and socialise (we’re not sure what the passengers in row 11 of Business Class directly behind would think of that!). In reality the cabin crew used it to pass between the two aisles out of sight of the passengers. You would never know they were doing it if you weren’t paying attention (they must be trained to tiptoe). We liked the elegant colour scheme, with dark brown leather seats, warm orange accents, beige internal wall padding in each mini-suite and a smart brushed mid-grey finish on the outside of each seat privacy shell. The extended curved partitions improve privacy compared to the older 2006 version of this seat. The seat itself is huge at 35 inches wide (2013 Business Class measures 28 inches). Two reasonably sized adults could sit alongside one another in the same seat without difficulty. A full-height privacy divider is raised between the middle seat pair if you are flying next to a stranger. This isolates these seats almost completely from each other, and even though we would still opt for a window seat if flying solo in this cabin it would be no issue at all to be in one of the middle seats either. On both flights the cabin crew were immediately very attentive and welcoming. Departing San Francisco, Dom Perignon Champagne was offered on the ground, with Krug also available but only after takeoff. This is typically to save on duty / taxes payable while the aircraft doors are open, however departing Hong Kong on the second leg of the journey both Champagnes were offered on the ground, so perhaps the taxation issue is less significant there. Hot towels and menus were provided shortly afterwards, alongside a warm, friendly and familiar welcome from all three of the crew who were dedicated to serving the First Class cabin on the evening flight to Hong Kong and the morning flight to Singapore (it’s a different crew on each flight). There are no overhead lockers in this First Class cabin. This gives a nice open and airy feel to this section despite it being quite small. Luggage storage is therefore primarily under the footrest. The storage space is an extensive area that would comfortably house even the largest carry-on bags without intruding into the remaining seat space. Excess cabin baggage can be stored by the crew in the galley should the situation arise. That also means your bags are within easy reach throughout the flight. Additional storage and a vanity mirror are provided next to the TV, behind a panel with integrated lighting when opened. It’s here you’ll find your headphones, and there is ample space for several other personal items or devices you might need easy access to during the flight. Alongside the seat just below the armrest furthest from the aisle there is also an additional storage compartment behind a sliding door. Again this is illuminated when opened and is ideal for your mobile phone, passport and boarding pass etc. A USB charging socket is also located here. Along the side of each seat is a large literature pocket. This is a great place to store your leather-bound menu and any other reading materials, though we also find it handy for keeping tablets and smaller laptops within easy reach. Beneath the TV there is a multi-standard 110V AC power socket, which supports Australian, Japanese, UK/Hong Kong/Singapore Type G, US 2/3-pin and European 2-pin plugs. Along this side of the seat there is also a shelf for your smaller devices to rest while charging. The power socket remains accessible when the seat is in bed mode. A sturdy table extends from below the IFE screen. It is adjustable in a forwards and backwards direction and also in height, so you can find your perfect position. The movement of the table allows you to temporarily gain access to or from your seat during a meal if required, simply by sliding it towards the IFE screen. Singapore Airlines is now providing the relatively new Lalique amenity kits and pyjamas on most First Class services, including those operated by the Boeing 777. This flight was no exception and we were provided with the attractive leather amenity kits shortly after boarding. Scented Candle (75g). Not to be used onboard for obvious reasons. The special gift is a small version of Lalique’s iconic crystal fish sculpture. These are available in 29 colours, for a limited time only. Pyjamas were provided in different sizes. We both opted for small, though as our regular readers know we don’t tend to use them, instead preferring to bring our own clothes for sleeping on flights. Socks and slippers were also brought around after takeoff from San Francisco, though these were unbranded. On the shorter HKG-SIN sector no amenity kit or pyjamas are offered, even to those joining the flight there, something to bear in mind if you plan to fly a shorter flight in this cabin class. The First Class section on the 777-300ER features two toilets for a maximum of four passengers, an excellent ratio ensuring there was never a wait. In size terms the toilets are relatively standard, certainly no match to the huge A380 Suites toilets on the latest 2017 version, however they were kept spotlessly clean throughout the flight and had attractive backlit mirrors. Lalique toiletries are provided, this time perhaps a slightly more useful range than you’ll find in the amenity kit with Eau de toilette, body lotion and facial mist. An additional amenities drawer is well stocked with razors, combs, sanitary napkins, toothbrushes and toothpaste. There is a fold down table designed for baby changing, however we find this useful when dressing for bed. Each seat features a large 24-inch high-definition TV, an enhancement on the 18-inch one you’ll get in the Business Class cabin on this plane. The system is controlled through a touchscreen handset, which is housed behind a sliding compartment at the aisle side of the seat within easy reach. The extensive content offered on KrisWorld features over 1,000 options including movies, TV shows, music and games, so whether you’re on a daytime flight or just having trouble sleeping there’s always plenty to keep you occupied. You can take a look at what’s being shown on your flight on the Singapore Airlines website. The entertainment experience is always best rounded off with a good pair of noise-cancelling headphones, and in First Class Singapore Airlines offer the excellent Bose model. These are nicely presented in a branded case when you arrive at your seat. There is even a handy hook on the suite wall for you to rest your headphones when not in use. You can plug the headphones in at a socket on either side of the seat, which is one of those probably pointless but still thoughtful additions. Note that since November 2018, Singapore Airlines has introduced Bang & Olufsen headphones in the Boeing 777 First Class cabin. There are two versions of Wi-Fi installed on Singapore Airlines’ Boeing 777-300ER fleet, the OnAir system and the T-Mobile system. We weren’t able to use our Boingo accounts for unlimited in-flight Wi-Fi access on this flight, as it was one of the older 777-300ERs with the OnAir system. First Class passengers do receive a 100MB free allowance however, which does last a while. We were able to post some updates on Instagram along the way, even connecting with a Mainly Miles reader flying on the same flight, what a small world. Do follow us on IG if you don’t already! There is an easy to access panel of seat controls at shoulder height on the privacy lip curving in towards the seat. This allows you to adjust the seat recline, leg rest angle and leg rest extension. There are also lighting, cabin attendant call and do not disturb functions, and a master on/off switch for the IFE screen. We both found these controls well placed and easy to use. We were barely climbing through 15,000ft after departure when the crew took another drinks order, and brought around a selection of nuts. These included honey roasted nuts and cashew nuts. Of course the crew were happy to prepare you a mixed selection too. Now that we were airborne it was time to start on the vintage Krug Champagne. As always, we check on the Vivino rating (out of 5 stars) for the Champagnes and wines offered. This selection was available on both flights, from San Francisco to Hong Kong and also from Hong Kong to Singapore. The stand out option here, other than the excellent pair of Champagnes, is the 2016 Clonakilla Shiraz. It is probably the best Australian red wine we’ve tasted all year, highly recommended if that’s your thing. These are excellent scores all round, as you would expect from Singapore Airlines in First Class and in line with our experience in the new A380 Suites Class. As you will know if you’ve read our reviews – we are big fans of ‘buddy dining’, where you can enjoy your meal opposite one another almost as though you are in a restaurant (a very small restaurant in some cases, like on BA’s 747!). Unfortunately, despite the massive space in this seat, there is no additional ‘ottoman’ seat for this purpose. As we’ve already mentioned the actual seat is so wide that couples could quite happily sit next to each other – but there isn’t room to dine together. The menu was provided on boarding, and included supper for our first sector between San Francisco and Hong Kong, followed by breakfast prior to landing. On the Hong Kong – Singapore sector it was breakfast again, due to the early departure time. Along the way, sandwiches, noodles and snacks were also available to keep us going. This was the menu for the supper service after takeoff from San Francisco. Click the images to enlarge. The crew came round with a bakery selection, served with butter or flavoured olive oil. Having skipped the signature Polaris burger in the lounge, Eddie decided to have two starters. The first was the Malossol Caviar with Marinated Lobster. This is a really excellent tasting dish that is simple, clean and superbly presented. We may even prefer it to the more commonly served Caviar and Melba toast. Eddie’s second course was the Curried English Pea Soup. Quite thick in texture and perhaps slightly cooler than optimum, the flavours however were excellent and the shredded Radicchio garnish provided a good contrasting bitter bite. I opted for the smoked haddock with endive and lemon dressing. It was nicely presented, almost in a sashimi style. The lemon dressing gave it a sharp flavour, a nice contrast with the fish, but a little overpowering I thought. It was a perfectly acceptable dish but a little forgettable. Before we get on to the main courses, a little time check for those of you concerned about the very late departure of this flight. For reference, it was 2.45am before we were tucking into our main course. By the time dessert was offered, it was 3.15am! The service was well-paced and prompt, so that’s no criticism of the crew, but do be aware roughly what time you will be expecting to stay awake to fully experience the service offered on this late night flight. If your body is on USA time, you may be struggling a little at this point. Eddie chose a slightly lighter main course of Chicken and Avocado Quesadillas. The quesadillas were soft but not soggy, the flavours were authentic and well spiced. The standout element was the two relishes plus the lime cream on the side. For my main course I chose the beef tenderloin with potato puree and peperonata. This was a truly excellent dish. The cook on the steak was medium, which was perfectly acceptable for me, and the flavour of the beef was superb. The accompanying potatoes were well prepared and the roasted vegetables were in a rich tasty sauce. Without a doubt, one of the best main courses I’ve had on a plane (I usually prefer the starters, but not this time). For dessert there was just enough room to try the Plums and Creme Fraiche cake. I don’t normally have a sweet tooth but it was really good. The raspberry sauce was exceptional. Unfortunately I couldn’t really do justice to more than a few bites given the local San Francisco time, I was seriously ready to sleep. After dessert the crew came round with an impressive fruit basket, including fresh berries. Though I was too full to even consider taking anything from it by this point, I did manage to snap a photo. We had plenty for dinner and prioritised sleep time, so neither of us sampled anything from the ‘Delectables’ section of the menu. If you do get peckish in the night however, it includes noodles, sandwiches and other snacks, and you can click to download it from the menu section above. After dinner it was time to get some rest. The cabin crew offer turndown service, and this is when we finally realised what is in the large cabinet behind the TV screen at the front of each seat! As with the Singapore Airlines 2006 and 2013 Business and First Class seat types, the seat must be flipped over to be converted into a bed. That means you can’t easily alternate between bed mode and seat mode, though personally we’ve never seen this as a huge drawback. Once converted, this becomes the largest bed in the Singapore Airlines fleet, at 35 inches wide and 85 inches long. That’s approximately 89cm x 216cm. It’s two inches longer than the 2006 First Class bed and four inches longer than the 2006 Suites bed. If you’re wondering about the bed in the new 2017 Suites on the latest A380s, it pales into insignificance at 27 inches by 76 inches – smaller than both the 2006 and 2013 Business Class beds (though those do narrow at the foot end). Bedding is by Lalique and is very comfortable, with a generous mattress topper, plush duvet and two full size pillows. The large footrest space beneath the IFE screen allows you to sleep comfortably in whatever position suits you. A commonly mentioned drawback of the Business Class seats is the small cubby hole for your feet, requiring you to extend your legs at an angle while sleeping meaning these are better for side sleepers but not those who sleep on their front or back. Not an issue in this bed. This is honestly the most comfortable bed either of us have slept in on a Singapore Airlines flight. It’s up there with the Cathay Pacific First Class and even gives the Qantas A380 First Class bed (which is superb) a run for its money. We slept solidly for close to 8 hours until the flight was approaching Hong Kong. Compared to the A380 Suites bed it is much more comfortable, we found that one to be very firm in our recent experience. We skipped breakfast on the first flight to maximise our sleep time prior to landing in Hong Kong, knowing that we would have a bite to eat in the lounge and a full breakfast on the second sector from Hong Kong to Singapore. One additional benefit of choosing the aisle and window seat as a couple then became apparent. Despite both the 1A and 1C passengers having breakfast, we were not woken as that service happened exclusively via the left aisle, with our ‘side’ of the aircraft remaining unused. I think it is the first time I have not even been aware that service was happening around me in the cabin while I slept, such was the serenity of the right side of the cabin, with zero aisle traffic. If you’re ending your journey in Hong Kong you’ll probably want to eat prior to landing, so here is the breakfast menu from the first flight. A cappuccino was all that was required for us before landing in Hong Kong, and of course the crew happily obliged. After relaxing in the SilverKris lounge, it was soon time to board and depart again for Singapore. The breakfast menu on the second flight between Hong Kong and Singapore was very similar to the previous one, so we didn’t feel we missed out by skipping the first breakfast service. We both started with juice and fresh fruits, which were excellently presented. I then opted for the fresh scrambled eggs with beef sausage. This was served with tomato, mushroom and potato and was really tasty. The scrambled eggs in particular were fluffy and light, and just needed a little seasoning for full flavour. Eddie went for the Dim Sum selection. It was tasty and also very well presented. The extensive menu doesn’t stop there, with a range of cocktails, soft drinks, tea and coffee available on both flights. These are the options, just click the menu pages to enlarge. I had a cup of Jamaican Blue Mountain (the so-called “caviar of coffee”) prior to landing in Singapore. It’s expensive stuff, and is exclusively available in First Class and Suites. It was a great choice, smooth and full-bodied. We have to mention the outstanding service provided by the cabin crew on these flights. They were all so friendly, and addressed us by name throughout. Nothing was too much trouble and our glasses never went empty (unless we wanted them to). The same applied with the two different sets of crew on both the first and second sectors of this two-stage journey. With dozens of Singapore Airlines premium cabin trips under our belts, the service on this one was right up there with the best we have experienced. How can you experience SQ 2013 First Class? 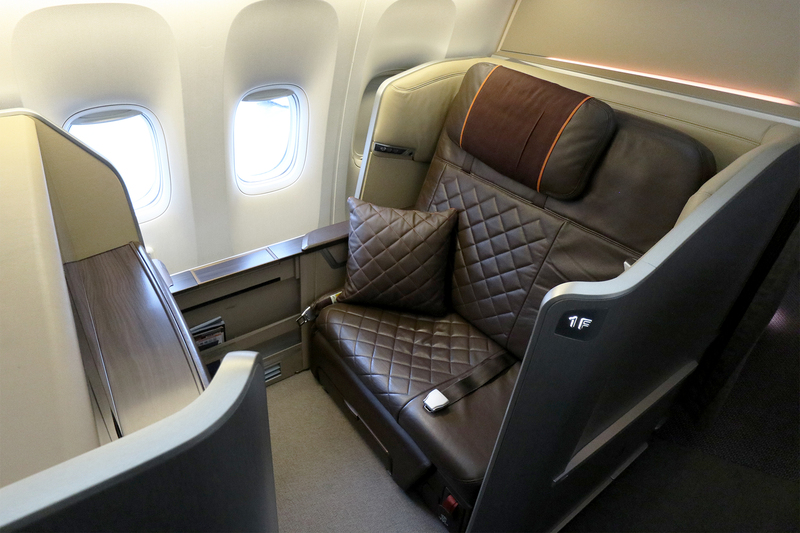 This particular version of Singapore Airlines’ First Class is exclusive to the Boeing 777-300ER, though that’s a large fleet totalling 27 aircraft at February 2019. For award seats, which are more common than you might think despite the small four-seat cabin, you’ll have to be using Singapore Airlines KrisFlyer miles or Virgin Australia Velocity points, as SIA block long-haul First, Suites and Business Class products for redemption through other Star Alliance partners like United and Lifemiles. The lowest KrisFlyer miles rate currently available to fly this product is 45,000 miles for a one-way saver award between Singapore and Hong Kong, though there are some longer flights available for 53,000 miles such as Beijing, Delhi, Mumbai and Shanghai. Singapore to or from San Francisco or Los Angeles are the most expensive redemptions, at 130,000 miles one-way for a saver award. Remember if you are flying on a Singapore Airlines Boeing 777-300 (non-ER), these aircraft feature eight of the older 2006 First Class seats. A two-row cabin on the seat map is the giveaway. A faultless experience, the 2013 First Class seat is a wonderful private space despite the lack of closing doors you might expect to find in a Suites-style offering. With only four seats the atmosphere is very intimate. Service was exceptional, easily among the best we’ve had on Singapore Airlines. The bed was large and very comfortable, and the food and drink on the whole was excellent, a real step above Business Class. This was our first experience of the product and it’s now our favourite non-suites First Class seat so far. The seat finish and fittings are elegant and all in top-notch condition, despite this particular aircraft being refitted with this product nearly two years before our flight. Singapore Airlines is planning a brand new Suites cabin for its upcoming Boeing 777-9 aircraft, which benefits from 10cm more cabin width than the 777-300ER and will enter service in 2020-2021. We are certainly excited to see what features it will offer, given Emirates have now moved into the fully-enclosed Suites arena with their 777s (see our review of that). Overall there was really very little, if anything, to fault during these two flights. It was the perfect end to our ‘Round the world in First Class’ trip. We can’t wait to fly this product again and would highly recommend it to those who wonder if it’s worth the extra miles over the 2013 Business Class seat. I like these seats.. for all the reasons you mentioned.. I didn’t like it when they reduced the number from 8 to 4 though.. for the same reason I didn’t like it when they reduced the number of Suites from 12 to 6.. simply because this just makes award tickets all the more difficult to get.. I do like the fact that because it’s now just 4 seats, in theory at least, one could expect (even?) better levels of service, which you got (so envious), because even though the wife and I were also two out of four, service levels were.. well.. ‘a bit off the mark’.. but this has been our experience over the past years.. I don’t think it’s whether you’re in Y, J or F/R.. (sorry, I’m not a fan of PE and still don’t get the product).. but more so the person in charge of the cabin, that makes all the difference.. which I feel is a bit sad.. but of course, this whole subject can be debated until the cows come home, so I’ll just leave it as that.. The seat.. I like it.. a lot.. not as much as even the old Suites (haven’t yet tried the new ones, on Waitlist next month out of EU, so please say a prayer for me) but it is, to me, a very solid product indeed.. but to be fair, I’ve only flown F/R products on SQ.. so do not have any experience with offerings from other carriers.. I also like the Lalique bedding, which 3 of us got to experience on old R, SIN>KIX last Dec (good luck with that with new R, right?).. Food.. again I’m so envious of both of you.. I have not had any form of decent beef, in any class, on SQ.. best steak I’ve ever had onflight was CX J SIN>BKK, which are really surprising.. no BTC no boot.. even the Malossol Caviar, which I’ve had a number of times.. even out of SIN.. lobster was over cooked, hard and tasteless.. and I still don’t understand why overnight flights don’t get caviar.. if it was short-haul vs long-haul, I’d find that easier to understand.. but alas… and the history we’ve had with dim sum.. after trying twice, we gave up..
Slippers… they look at J slippers, no?? And.. Check-in time.. was a good mention.. same at HND.. don’t go early thinking you can check in early and go to the lounge… same (I think) 3.5 hours before departure time.. Slippers are Lalique too. Definitely exclusive to First! ‘Old’ F slippper were dark blue (much better quality than in J) and color-wise, closer match to Lalique PJs, no..? Which, btw, I too don’t use onboard.. I bring home, wash, and use on trips and toss in trash after.. saving weight coming home..
Say.. Eddie.. Seeing you’ve flown both.. How would you compare and which did you prefer..? Emirates new First or these seats..? Thanks! Hi Happy, sorry for the late reply. Speaking purely from a hard product perspective, the new EK F wins, but it’s a different generation of seat (or even suite) with a floor to ceiling door and a 1-1-1 configuration – it’s like comparing SQ 2013 J with Qatar’s Qsuites. The SQ Service makes up for a lot of the hardware shortfall though. Always has! Awesome review! I’ll be flying the SQ 777-300ER F Class from Singapore to Sydney in September and can’t wait! Probably should change your name, Happy Camper! I’ve always thought campers lurk and hardly comment, but your thoughts on just about everything was almost as long as the actual post! You should think about changing your name, Happy Camper! I’ve always thought campers lurk and hardly comment, but the thoughts you’ve shared on just about everything are just as long as the actual post! Hahahaha… TWO with same comment?! It’s quite obvious that you both, and I, were born in a very different era… difference being that I know what your ‘Camper’ means, but maybe you don’t what mine means..